1).How many Industries are from core sector of India Economy? 2).What is the new date for GST roll out______. 3).Recently, Mobile World Congress was held at______. 4).Famous Tennis player Rafael Nadal is belongs to which country? 5).Under which of the following acts, Maharashtra Government has banned beef? 6).Government has introduced Insurance Laws (Amendment) Bill 2014 in LS, this new bill will NOT amend which of the following bills? 7).In order to reduce the inflation below_____, Union government and RBI has signed an agreement? 8).As per Forbes 2015 Billionaire List, who is the youngest billionaire? 9).________, was launched by Election Commission of India to bring out a totally error-free and authenticated electoral roll throughout the country. 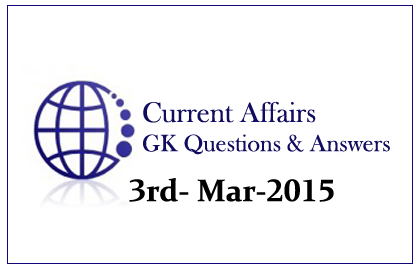 10).Recently, Government has amendment the Citizenship Act _______, and formed Citizenship (Amendment) Bill, 2015?